Only 20 percent of surveyed Seattle residents primarily drive alone, while 18 percent drive with passengers. All told, 61 percent of Seattleites favor green transportation for general use. Outside the city, all that driving is subsidized by employers. According to the survey, 82 percent of workers in the region can use “free” parking spaces at work—spaces that are subsidized by the employer via lease or property ownership. Meanwhile, only 35 percent of respondents knew that their employer offered some sort of transit subsidy, and only about half of those people—17 percent of the total, regional survey group—took advantage of the benefit. 16 percent of respondents didn’t know whether their employer offered a benefit one way or the other. Of course, the main culprit for car dependency is, as always, low-density land use. Even in “regional growth centers” outside Seattle—i.e. Everett and Tacoma’s urban villages, and suburbs’ town centers— transit and walking each separately account for 14 percent of all trips. In the suburbs and exurbs outside those town centers, walking and transit only account for 9 percent and 7 percent of trips, respectively. 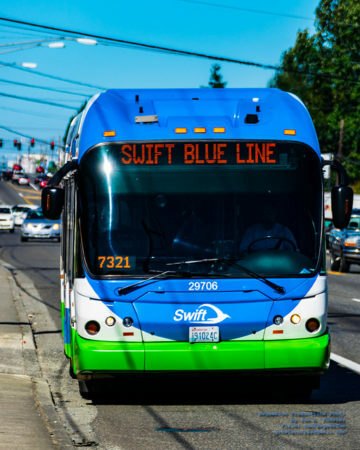 But the fight goes on, and the right side is winning: the Puget Sound region remains one of the only metro areas in the United States with a growing (or stable) transit mode share. With terrible traffic only getting worse, and significant regional investments in transportation on the way, the PSRC “expect[s] an increase in transit and walking” in the future. I didn’t realize I was fighting a War on Cars. Glad to know we’re #winning. We’re losing on 35th Ave NE, 23rd, Rainier, and probably some other streets. Roosevelt RapidRide lost to bikes on Eastlake and cars on Roosevelt. It’s still unclear whether RapidRide 44 will be any faster than the status quo. SDOT has talked about center lanes between I-5 and 15th and something west of it, but it has still not committed to a level of service. Seems like it’s a bit tongue-and-cheek. Anyway, congrats on your $4 billion car tunnel, Seattle. The war is over. I didn’t realize we were winning the “war on cars”. Seems like a daily occurrence that I’m nearly hit by a car while on foot when I have 100% right-of-way at a crosswalk or controlled intersection. Is this like when Bush declared Mission Accomplished in the 2003 Invasion of Iraq? Winning? Fighting? Those aren’t good word choices. This is a survey of human behavior and not even an analysis of zoning regulation or policy analysis. If anything, it’s more of a statement of general health than a militaristic assessment. I’d also point out that winning is a chronological concept. This doesn’t compare the results with past PSRC surveys. A decent reporter would be comparing this with a past PSRC household survey before saying that Seattle is ‘winning’. It’s kind of a basic journalism concept to substantiate the headline in the article. You have to frame things in a way most Americans will understand and everything is a “war” in America. Gridiron football is essentially a war of less than 12 actual minutes with about 120 battles. I fail to see how you are winning Cars have all the registered kill. I have never heard of a bicyclist hitting a car and then every one in the car dying, or Bicyclist getting so made he ran a car off the road in to a ditch, or even getting so angry he got cut off in traffic that he pulled his gun out and start firing at the driver in front of him. The protected bike lanes are so dangerous if you are a pedestrian. There is rampant disregard for the traffic signals. I have nearly been hit crossing second avenue several times. Slow down and pay attention self righteous jerks! But it’s completely fine for cars to disregard all the rules of the road, right? How many pedestrians are killed or even injured each year from 20-30 lb bike running over their feet? Give me a break. Get your priorities in line. Where did you get that? I think they would prefer both cars and bicyclists (and pedestrians) all obey the signals downtown. Apparently fish = red herring. The tu quoque defense is generally considered invalid. Tu quoque is better known as whataboutism in slang. I wasn’t in any danger? If I hadn’t stopped quickly and got out of the way the bike rider would have run me over. You say that bikes are maneuverable and they have better visibility. That don’t matter. The law says you stop for pedestrians in the crosswalk but your attitude is so typical of bike supporters. Traffic laws don’t apply to bike riders. Traffic laws apply to everyone. But speeding and ignoring traffic lights in a motor vehicle (something you see constantly) is orders of magnitude more dangerous than when on a bike. Bringing up the dangers of bike riders is like focusing on the dangers of asteroid strikes. Yes, they have killed a lot of people over the years, but it’s an insane outlier in the grand scheme of things. Motor vehicle operators killed 40,000 people in this country every year. You should be concerned about that. I almost got run down by a bike rider and the only reason I didn’t is because I took evasive action but you don’t care because in your mind bike riders are sacred cows and in your opinion you can’t say anything critical about them. How many pedestrians have been killed by cyclists in Seattle? How many have been killed by motor vehicle operators? An elderly woman was killed by a bicyclist on the Green River Trail a few years ago. It may not be as common as a pedestrian killed by a motorist but it does happen. This is an excellent boomer parody account. Keep on keepin’ on. Bicyclists in Seattle are like cows in India who are sacred and god forbid if you say any negative thing about them. And yes I too have been almost run over by them when I have been in the crosswalk and had the green light in my favor. When I yelled at them I got the one finger salute and I know damn well it didn’t mean I was number one. Yes drivers in cars do wrong things but there are bicyclists who feel that the traffic laws don’t apply to them as they run red lights, don’t give the right away to pedestrians, go to the wrong way on one way streets, don’t signal when they change lanes and I can go on and give more examples.. But god forbid don’t you dare to say anything negative about them. They are sacred in Seattle. Jeff where exactly are you wanting (but unable) to say negative things about bicyclists? People who say they were “almost run-over by a bike” are typically people who don’t understand that bikes are different than cars. More maneuverable, with significantly better visibility, traveling at a much slower speed, and carrying less mass. There is a reason you were “almost run over”. The cyclist saw you and went around you. You were never in danger. Sure, people on bikes disobey traffic laws. The difference is that they aren’t killing tens of thousands of people a year. Focusing on “dangerous bikes” in the name of street safety is like being a budget hawk who wants to defund NPR to save money while ignoring things like say, defense spending or tax cuts for oligarchs. It’s obvious your concern isn’t actually about the budget (or street safety). It is hard to believe we are winning against the car people when every construction site in the city is constantly closing sidewalks and detouring pedestrians and bikes, while never closing or detouring vehicular lanes or dropping street parking to make temporary sidewalks. I get pretty incredulous when I am forced to walk a block out of my way on foot while the damn cars just blithely carry on unimpeded. One easy piece of low hanging fruit for the suburbs is to build more pedestrian paths that connect residential cul de sacs. This reduces walking distances to transit and to local businesses at a fraction of the cost of running bus service. It also makes it possible to move about the neighborhood on roads with modest car traffic moving at relatively slow speeds. In some cases, this would require buying out a few feet of somebody’s back yard (and redoing the fencing and landscaping); in others, it’s simply a matter of chopping down some blackberry bushes and throwing down some gravel. There are actually several places where this has already happened, but it’s mostly the wealthy suburbs (e.g. Bellevue), while in Kent, you’re expected to walk all the way around. Another easy thing to do that shouldn’t generate war-on-cars pushback is more tree planting. Street trees psychologically encourage drivers to slow down, while providing pedestrians with welcome shade that makes a walk on a hot summer day much more comfortable. A third item that can make non-car mobility much easier in the suburbs for relatively little cost is trail building. Imagine what getting from Redmond to Woodinville on a bike would be like if there were no Sammamish River Trail? It would be a lot more dangerous, and far fewer people would do it. The Eastside Rail Corridor Trail is a good step in the right direction, and we need more rail trails like it. In general, I think nearly every suburban greenbelt should have some kind of a trail through it, even if it’s just a walking/hiking trail, or even a staircase. The ONLY recent hint of improvement, is, ironically, the sales destination collection change from several years ago which is now causing the city to start to want to rely on warehouses and trucking less. I heard from a city development employee that the city has largely only considered the needs of large trucks in terms of downtown planning in the recent past. Hopefully this is starting to change! Only 38% of Seattlites primarily drive? That seems hard to believe. Even in southwest Capitol Hill and Ballard a lot of people drive almost exclusively, and the street parking is full and the apartment garages are almost full. Even in San Francisco and Chicago I’ve seen residents drive literally between two BART stations or el stations. They know where the train goes because they ride it sometimes, but they usually drive. It’s a sharp contrast with New York and London where the majority of people don’t have cars. And in Moscow it’s common to come up from the Metro and find thirty people waiting at the top for somebody to emerge, and for people to meet at a Ring Line station and walk to an evening activity. I’ve seen the latter to a smaller extent at Vancouver’s Broadway station. In Seattle there are some people like me who live in urban villages and don’t have cars and use transit/walking/biking most of the time, but most of the people I know drive to anything other than work or a simple urban-village-to-urban-village trip. It’s hard to invite people to my apartment or to an inner-city restaurant because they can’t find parking, and often I have to meet them in U Village or the suburbs or somewhere that has parking lots. Visitors can get parking in capitol hill, but they gotta go to a pay parking lot: Cheap people:). It depends on the neighborhood in so far as how much you need to drive. Here in West Seattle, if you don’t live in close proximity to the Junctions, you have to drive to do most errands that require carrying a lot of goods or groceries–If you want to go to a super market around here, you have to drive 1.5 miles in one direction, or 2 miles in another. I think the elephant in the room for people driving to P & R’s in the suburbs is a lack of good bus connector service. I suspect that many people live 2 or 3 miles from the Bus or LR park and ride and don’t have the time or dexterity to walk or ride a bike to them and lack consistent, if any at all, bus service to get to the P&R, so they have little choice but to drive. I agree on your point of driving to P&R’s, but it’s a hard problem to solve. Walking 2-3 miles each way is not going to happen regularly for almost anyone (that’s at least 30-45 minutes each way). Biking is doable for most people, but then what do you do with the bike? Yes, buses have racks, but they’re a pain to use, often full, and not a good solution. More bus service is of course doable, but extremely expensive if you want to get even 15 minute coverage on all suburban routes. Honestly, the best way to get the suburbs out of cars is to move people to bikes. And the only way to do that is to put in real infrastructure (good bike lanes everywhere with signal priority, good parking at P&R’s, etc…). If you’ve ever been to the Netherlands, then that’s what I’m referring to. But that requires everyone to buy into the idea and to have a real war on cars. I think the study is for employment only. Lots of people drive other places. We are nowhere near other big cities around the world in terms of having the bulk of people use bikes and transit as their primary means to get around. We are, unfortunately, pretty typical for America. The 38% is probably just home->work trips during rush hour, because that’s what the official commute survey measures. There is still a culture among many people that transit is for getting work, cars are for everything else, and that culture is used to justify crappy off peak transit service. The problem is that, unless you make regular road trips every weekend, that’s a lot of money to pay for relatively few miles. And, that model still requires a residential parking space for every person. Until relatively recently (a dozen years or so) “car sharing” didn’t exist except in the “rental car” model or expensive, monopolistic taxis. That’s why everyone has a car, cost per mile be damned. And once one has a car it require real self-discipline not to use it for spur-of-the-moment trips. There is still no car sharing outside the Seattle City limit boundary, except for about 2-3 Zipcar spots. What has changed, however, is services like Uber, Lyft, which provide service across the entire region and don’t arbitrary shut off when you cross the city boundary. In general, I’ve found many of the trips I used to use Zipcar for, back in the day, can now be done for significantly less money with Uber and Lyft. Which means the need for actual carsharing is now mostly relegated to trips that involve exurban or rural areas, where Lyft/Uber service either doesn’t exist, is not reliable, or is prohibitively expensive. Which means that, in spite of the lack of carsharing outside the city limit boundary, the need to own a personal car when living outside that boundary, is a lot less than it once was – at least for those that don’t leave the city all that often. I would still like to see more carsharing in some of the suburbs, though. I find it very disappointing that, even very urban neighborhoods, such as downtown Bellevue, Redmond, and Kirkland, have significantly worse car-sharing options than very suburban neighborhoods, such as Magnolia and Lauralhurst, simply as a result of which municipal jurisdiction they fall under. Downtown Kirkland, for example, has no rental car options at all, unless you’re willing to travel at least as far as either downtown Bellevue or Totem Lake. Exactly. Most people I know won’t pay for a lot outside downtown or a large institution. They’ll circle the block until they find a space, or give up and vow never to come back to the neighborhood. They have started to take transit downtown, but not to other places. I use to live in Seattle before I moved Murfreesboro TN. I worked at a towing service in Seattle. Trust me 38% using cars is WAY low. we were constantly on the helping stranded motorist or helping with wrecks. I would like to see these stats to see where they arrived at this. Did your business (1) offer to tow bicyclists and pedestrians or (2) ever tow more than 100,000 or so cars during a single commute? If not, I am not sure your experience sheds much light on the validity of the 38% figure. Of course towing companies see mostly cars–that’s the only mode with a demand for their service. I’d say the percentage of STB readers who’d have occasion to call a tow truck in Murfreesboro is close to nil. I believe this stat refers only to people commuting to and from work or school. It doesn’t gauge whether or not people own cars or use them for non-work errands. I live 2 miles from my office, near major bus lines and light rail, and maybe drive my vehicle 2 times a month (not counting to ski or hike). Transit makes total sense for me…it’s as quick as driving, and far less stressful. However, if I lived in Mill Creek and worked in Issaquah (or some such horribleness of a commute) I’m pretty sure I would always drive. I don’t begrudge those choices because the transit alternative is far inferior to driving solo, and until there’s a somewhat gold plated alternative (fast, frequent, spotless…ala Arlanda Express), it probably won’t happen for most people. I live two miles from my office, near major bus lines and light rail, and maybe drive my vehicle 2 times a month (not counting to ski or hike). Transit makes total sense for me…it’s as quick as driving, and far less stressful. However, if I lived in Mill Creek and worked in Issaquah (or some such horribleness of a commute) I’m pretty sure I would always drive. I don’t begrudge those choices because the transit alternative is far inferior to driving solo, and until there’s a somewhat gold plated alternative (fast, frequent, spotless…ala Arlanda Express), it probably won’t happen for most people. Nobody expects Mill Creek to Issaquah commuters to do anything other than driving because transit would take two hours each way. The same problem exists Everett to north Seattle: unless you work near the U-District it’s not feasible. Link will be a game changer in that regard. But “suburbs” doesn’t just mean exurbs. There are a lot of inner-ring suburbs like Bellevue, Renton, Tukwila, Burien, and Kent, and people who both live and work in the same city there, or in the Burien-Renton corridor, where transit is feasible, yet they still drive. If only we built housing near the jobs, and jobs near the housing……. Why is there not a sea of towering apartment buildings with enough units to house Amazon’s workforce in SLU, and the surrounding neighborhoods? Why is there not an office park (sans parking?) at the entrance of every suburban master-planned residential community? Our state’s land use and planning laws are useless. They’ll continue to be useless until we get to the bottom of our transportation problems. We don’t expect school children to be bused from Seattle to Tukwila, or from Tacoma to Kent, or from Everett to Kirkland. No, we build schools where the students are located. That’s way too simplistic a comparison. Education is an “industrial model” activity: almost all students do the same thing all day long. They sit in classrooms with books, chalkboards and computers. The school offers course instruction in as wide a range of disciplines as is appropriate for the age group it serves. All the kids of the appropriate age residing within the “educationshed” of the school can to go it. Workplaces, however, are by definition, employer specific. Unless “the suburban master-planned residential community” were built by a consortium of the employers in the office park and residences were restricted to their employee, people would drive right by the office park on their way to their actual employers. That’s the universal problem with suburban employment: since most families have more than one worker, all the members of the family have to work for the same employer or someone is going to commute. Usually all of them. American has a stupendous and permanent energy hole built into our obsession with wide-spread suburban living. We will always be less-efficient than any other country other than, perhaps, Australia. As energy costs spiral to the moon, it’s going to be a huge disadvantage. Fortunately for me, I started out in the day of 29 cent gasoline and will die before the entropy sets in. Funny you mention bussing kids. In the 70’s and 80’s about 50% Seattle’s school population was bussed that way. Not to Tukwilla, but across town. At 6:45 in the morning on my street you saw 4 bushes. One to Cleveland, one to Ingraham, one to Garfield, and one to Franklin. None to Ballard, where I lived. I was bussed for 4 years. It contributed to many families moving to the burbs. The purpose was desegregation not poor city engineering. There were 4 “busses”not bushes. Sorry. I think the language may have gotten a little slippery here. I think the 38% number was Seattle city residents who customarily drive to work, alone or with someone. It wasn’t a number for people who don’t own cars or don’t drive ever. Remember that work trips only represent 1/4-1/3 of total trips, people are traveling or driving for a variety of reasons In a city like Seattle–with relatively strong transit and a high density core, many people may mostly use their cars on evenings and weekends. Re the comment on suburban design: One thing that municipalities can do is prohibit walls around subdivisions, which make walking to transit prohibitively long. The article clearly mentions several times that this is about commuting to work. If anyone is able to commute by transit, it’s going to be a 9 – 5 downtown worker. You’d have to be a bit crazy to drive into downtown every day, I can’t think of anything I’d rather do less. We have a lot of crazy people–From my view on the bus as it pulls into the 99 exit into downtown, I see quite a few cars queuing up at the lights as well as in Pioneer Square. Some people are actually driving to work, but others are simply providing personal limo service for a friend or significant other. However, working in a law firm, I notice that quite a few lawyers drive: They can afford the parking rates in the office building, but they also tend to work very late hours when bus service is spotty and many drive home to the suburbs. About 5 years, the percentage of Seattle households that owned a car was only about 2 points lower than it was for Houston. A very disappointing statistic. It does say commuting to work. I must have missed the first page in my borwser. In that case, the number sounds more plausable. We know that downtown car commutes have cone down to around 30% because that has been reported multiple times, and the number of cars downtown is the same even though the the number of jobs and apartments have increased. A citywide car rate of 38%, maybe. It would be great if we’ve already surpassed 50% in work trips. I hope there will be the same dedication to reaching 50% in all trips. “Of course, the main culprit for car dependency is, as always, low-density land use.” Where is this coming from? Cite your data source please. In my personal experience as both a transit user and a car commuter, the lack of convenient routes between where people live and where they work is the main culprit. For example, I live in North Seattle and recently changed jobs from South Lake Union to Canyon Park. With my SLU job, I was able to ride a very convenient bus, Route 308, which took me 25 minutes door to door to travel 9 miles. My Canyon Park commute is still 9 miles but there aren’t any combinations of transit that will get me to work in less than an 1.25 hours. By car, that same route is 20 minutes. In my view, that has nothing to do with low density land use, it’s about accessible routes. I agree. Low-density land use makes high quality transit expensive to provide, but it doesn’t prohibit it. Some low-density neighborhoods happen to be on the way to major destination & therefore get good transit, and there a various ways to service low density neighborhoods, such as P&Rs, that while expensive can also be effective. Canyon Park is a low-density land use. It may have multistory office parks but they’re isolated in sprawl. As for going from one part of North Seattle to another, such as from NW 85th Street to NE 85th Street, or from Lake City to Ballard, this shows that density is essential but not necessarily sufficient to guarantee good transit access. Streetcar suburbs turned into car-dependent suburbs by simply reducing the transit that used to be there. Although the conversion of corner businesses to single-family houses accompanied it, and qualifies as bad land use. Hi Mike, I totally agree that Canyon Park is low-density land use but I don’t see how that’s connected to the issue of work commutes by transit vs car. If I’m missing something, I’m open to rethinking my opinion so please let me know. When I hear these conversations and blame of low density usage, what I feel is missing is the acknowledgement that people (especially families) don’t/can’t move with every job change. For homeowners like myself who have a 20-30 year mortgage, I will likely have somewhere between 3 and 6 jobs in that time and my commute will change with each job regardless of my workplace being in a low or high density area. This notion that we should all work local to where we live is just not reality for most people and it won’t be for quite some time given the fact that the average number of job changes is continuing to increase. For those people who do work local to where they live, it’s likely only temporary until the next job change. Because suburban office parks are a low-density land use, they are difficult to serve via transit. That’s literally the point. If your job moved from SLU to say, Pioneer Square, First Hill, or even Downtown Bellevue, you’d still be able to take the bus fairly easily, because those are high-density office districts. And they have good transit connections because they have a lot of jobs in a small area where parking is expensive to provide, unlike sprawling office parks or industrial areas that come with lots of free parking. You might want to consider starting or joining a vanpool. I work near Paine Field, where the transit connections from North Seattle are poor (minimum 1.5 hours each way vs 30 minute drive), and vanpooling is a great option, even better than driving. We are maybe winning because the region and city is flush with cash. Just wait until the next downturn and all our good current service will be severely slashed to terrible headways and the downward spiral will commence. Thats part of the reason a higher farebox recovery isnt such a bad thing. “The big culprit is low density lands use.” And there it is. They want us all serfs and using public transportation. God forbid- land sprawl. The point isn’t that low-density land use should be illegal. It’s that high-density land use should be legal. Why should the government force people, via zoning laws, to build low density? What are you, some kind of statist?